In addition to all the other ways you can customize your Team settings on CityGrows (including changing your Team name, URL, and adding your government's logo - learn more here http://help.citygro.ws/features/teams), you can now also change the color of the Menu bar that your applicants and government users see at the top of the page to match your government's color scheme and existing website. To customize the color, navigate to your Teams page (from the drop-down menu at the upper right of your screen). From the main Team Profile page, scroll down (if needed) until you see the color picker (just below where you can upload your government's logo). Move the slider along the color bar at the bottom and/or the white circle on the visible color square until you find the color you like, then hit the green "Save Color" button. 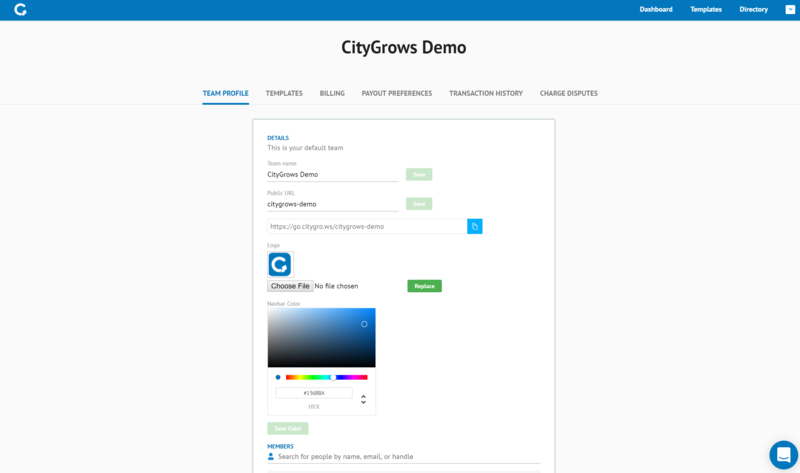 We hope you enjoy customizing the color of your CityGrows process pages. Please share any feedback on this or any other feature on our forum: http://forum.citygro.ws/.